Travelling long distances is something new for her. She would travel far to get to one destination only and come back. But now she travels and sometimes takes detours to get to a destination. The time to be there is vague…she tries not to depend on tight schedules. She knows somehow thy will be done. Perhaps some of her guru’s philosophy is rubbing off on her. She knows she has to learn her way and though through guidance, mantras or prayer, readings…these are simply tools to help interpret life around her….the one she was blind to. She was raised with a strict Catholic upbringing. She remembers her Grand-Maman beading her rosary every night. She now rolls each bead when chanting a mantra, a gift from her guru, Divine Mother, Amma. 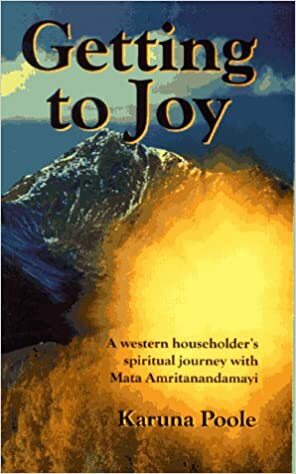 And yet reading The Pilgrimage she finds more parallels than differences in the lessons presented compared to Amma’s wise tales teaching her devotees. Today, as she was walking out of the Métro Rosemont, she noticed a young woman limping and her heart sank seeing her twisted foot in a heavy winter boot. Usually she would start chanting her mantra with a person in mind but for some reason as she walked out onto the street, she started reciting the Lord’s Prayer, ten Hail Mary’s and Glory Be to the Father. What made her do it felt natural…she was asking Mother Mary to help this young woman and at least give her a good day today. She had not recited these prayers in a while and she was not surprised…it felt natural and right. Thank you, Kristjaan, yes, I Am, One.